Red Bull lauds "dream start" to Honda engine tie-up after delivering the Japanese manufacturer its first F1 podium since 2008. Red Bull has hailed a “dream start” to its partnership with new Formula 1 engine suppliers Honda after securing a podium finish in the season-opening Australian Grand Prix. In its first grand prix powered by Honda following its divorce from Renault at the end of 2018, Max Verstappen turned in a strong drive to the podium, passing Ferrari’s Sebastian Vettel and shadowing Lewis Hamilton’s Mercedes on his way to finishing third in Melbourne. The result sealed the Japanese power unit manufacturer’s first rostrum in F1 since Rubens Barrichello finished third in the 2008 British Grand Prix and marked Honda’s best result in the current V6 hybrid era. “I think it was a great day for us to get a podium,” Horner told Sky Sports. “Max’s drive, his pass on Sebastian, he then put Lewis under a lot of pressure in the second half of the race. So it’s a fantastic performance - for us to get a podium first race with a new power unit is a dream start. Despite being labelled as the pre-season favourites by both Mercedes and Red Bull, Ferrari endured a poor race with Vettel and teammate Charles Leclerc finishing in a distant fourth and fifth behind Verstappen, who had split the Scuderia duo in qualifying. Asked if he was surprised about Ferrari’s race pace, Horner replied: “I think we’ve over performed in the race. “We were more competitive in the race than I thought we were on Friday,” he added. “To put Lewis under pressure for pretty much 50% of the Grand Prix, I thought we had the quicker car than him certainly in the second half. Verstappen said he felt he could have beaten Hamilton to second place had the race been at a circuit that allows for more overtaking opportunities. 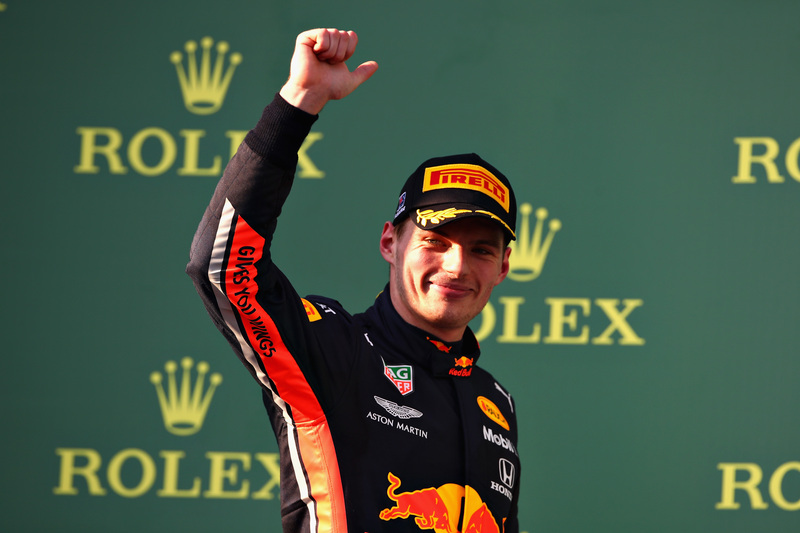 “Of course I’m very happy to be third here,” Verstappen said. “Also very happy first of all with the team but also for Honda because since we started working together it’s been amazing actually. I’m really enjoying it so it’s also well deserved for them. “I had a really good balance and I was just slowly pushing up to him [Vettel] and not destroying the tyres and as soon as I had the opportunity to go for it I went for it. "A good start! This was the first race of the season and our first with Aston Martin Red Bull Racing, so it was encouraging to finish third. It is the first time Honda has been on the podium since 2008 and the first time in this hybrid power era."